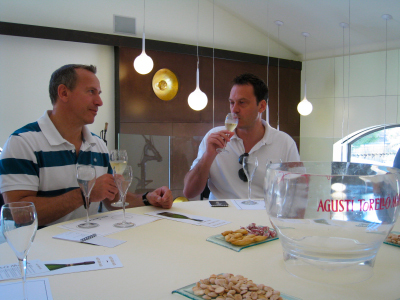 Thank you for the entertaining and informative wine tour of the Priorat region last Thursday (6/10/2010). It was our second best day (Jeff’s birthday was first!) that we had in Spain which included two days in Barcelona, a day in Tarragona and our days at the villa in Stiges. It truly felt like a family trip and everyone we met along the way were so genuinely nice and helpful. You are an excellent guide and a very charming individual. All of our bottles of wine survived the plane trip but unfortunately the ceramic bowl that Sandy purchased at Clos De L’obac did not. It is now in four pieces and we are trying to figure out how to glue it back together! Again, thank you so much for making our trip to Spain so memorable and if there is a future visit to your wonderful country, we would surely like to say hello. Julia MohauptHello Priorat wine fans!